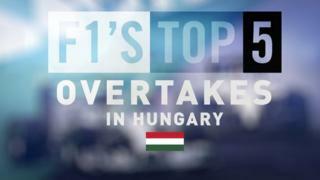 Watch five of the best overtaking moves from the the Hungarian Grand Prix through the years. The impressive passes come from Damon Hill, Daniel Ricciardo, Nigel Mansell, Fernando Alonso and Nelson Piquet. The inaugural race at the Hungaroring in 1986 broke new ground for Formula One as it was the first race behind the former Soviet Iron Curtain.